Today is August 14, Pakistan Independence Day and i want to share my new blog theme Material Pak WordPress Theme with all of you. It is really simple and light weight WordPress theme built with Google’s Material Design Lite Framework. Getting started with Google’s Material Design is easy if you are experienced developer and already using some other framework such as Bootstrap or Foundation but if you are new to we design and development then it won’t be easy for you to use Google Material Design framework. I have also created a new light weight theme for this blog and yes it is based on Material Design framework. You can download this theme free or pay what you want. This new theme does not offers 20 different page templates or fancy portfolio pages. This theme focuses on speed and content. 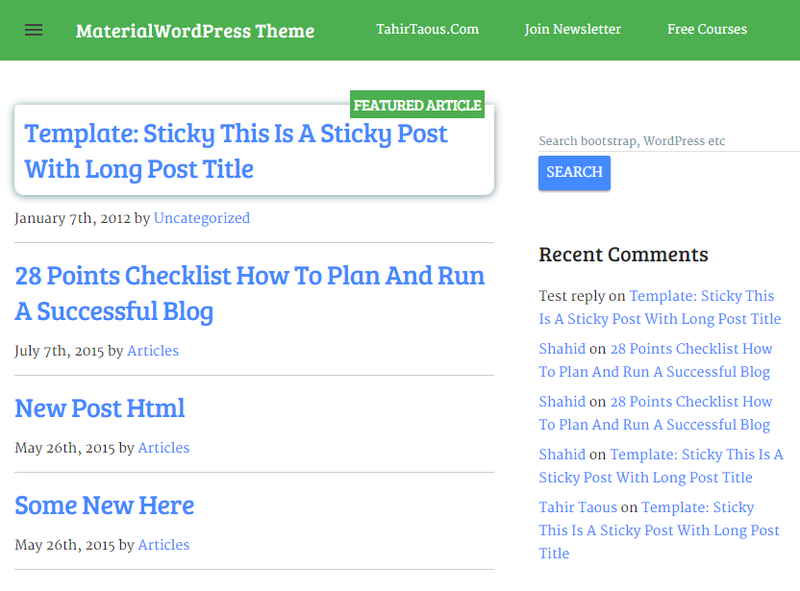 If you are a blogger and want a simple theme with elegant design, then this new theme is for you. 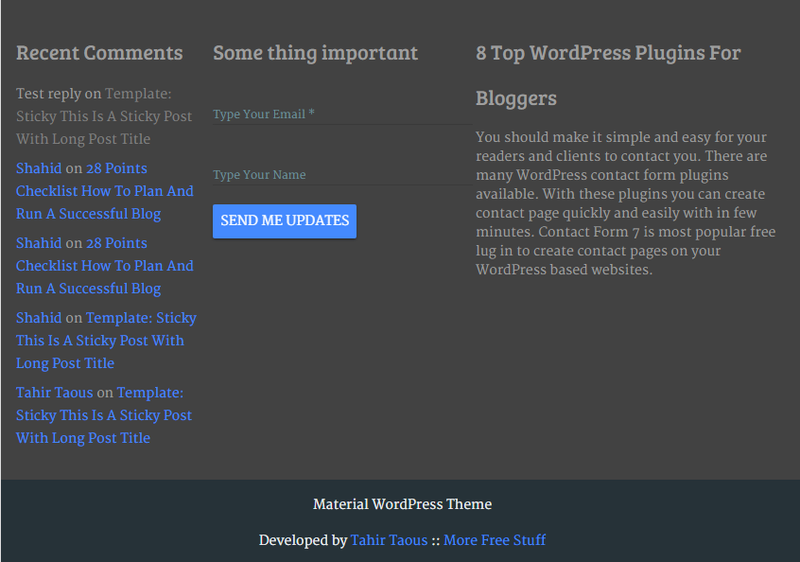 here are some screen shots and features of this new Material WordPress Theme. If you are reading this blog post, You have already seen this new theme in action, because i am using this theme on my blog as well. You can see home page has a simple layout, no featured images or post excerpt. just post title, published date, author name and category. You can see primary sidebar as well. You can use below post widget to display your most important content, ask readers to sign up for your newsletter, give then discount coupons or simple display recent or most popular posts. Web Fonts are very popular now a days and there are so many beautiful web fonts available. Choice of fonts can make your website or blog beautiful and attractive and reading experience pleasant. For headlines i have used Bree Serif and for main body text i have used Merriweather web font. This theme have two navigation menus, Primary and off canvas navigation menus. Main navigation menu will be hidden on small screen devices only off-canvas menu will be available on small screen devices. You can use 3 column footer layout to display different content such as recent posts, comments, products or email sign up form. These 3 widget areas will be available on all type of devices. Three page templates are available. first one with sidebar and another one is full width page with no primary sidebar and third full width blank page no sidebar, no header just a simple footer. Almost every new WordPress theme support nested comments and yes Material WordPress theme also supports nested comments. There are 5 widgets areas available. Primary widget area or primary sidebar, below post widget area, and three widgets areas in the footer. Almost every one use mobile phone and most people use mobile/smart phones to browse their favorite websites. As a blogger you can not ignore mobile users, your blog/website must be fully responsive and mobile friendly. Google also recommends responsive web design and if your website is responsive and mobile friendly Google will shows that websites is mobile friendly. Material WordPress is fully responsive and mobile theme because it is built with Google MDL Lite (Google Material Design Lite Framework). Today is Pakistan’s Independence Day and i want to celebrate this with all of you. You can download material design WordPress theme free of cost or if you want to support my work you can Pay whatever you want. It does not matter how much you pay $1 or $10. it’s up to you. If you find any issue or bug feel free to visit this page and add your comments or you can contact me any time. NOTE: An email address is required to download this theme. Don’t forget to share this with your twitter followers, Facebook friends and family and GooglePlus communities and followers.